Lock in a great price for Penzion Atlas – rated 8.7 by recent guests! Generally, the hotel was fine. They honestly state that it is a 3-star hotel, so it may be much to expect to have all kinds of comforts. All the necessary things were there: -the rooms were mostly clean (carpet floor though), the reparation has been done and the windows could be opened (but the temperature in the room was too high, no way of adjusting it besides opening the window), -the bathroom was "modern" in that sense that there was hot water and shower (but no clothes racks, pegs or stands where to put your clothes or towel, the shower holder was broken). Friendly people all around. Clean room and massive bathroom. Room was clean. Water always hot. Good water pressure. Bedding was clean. Beds were comfortable. Hotel is in centre of town. There is a balcony for smokers. Overall good value. Reception staff were generally helpful and did their best to communicate in English. Everything was as expected. We knew most of the things we wouldn't like about the hotel before we arrived. Good location, clean. Perfect for short staying. Big room. Very comfortable beds. Close to city centre and to supermarket. Security access key to the rooms area. Discret personel (only emptying the trash bin daily). Staff was friendly and helpful. Room was clean and nice, Pension is situated in a very heart of city, with nice view. I need to say big thank you to staff as we got in a rough situation when my girlfriend got a horrible headache and we didn't get any painkillers with us, fortunately staff was very helpful and kind, as the lady call her husband to bring the painkillers for my girlfriend, really didn't expect that big help. Highly recommended! Great location, fantastic value and helpful staff. 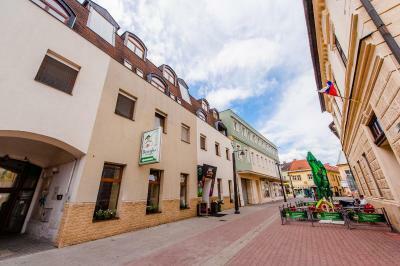 The adjacent restaurant is also great for an evening meal, breakfast or just a couple of beers at the end of the day. There was small accident when children broke a lamp. Was really nice to hear from administration that it is okey. We didn't have to pay for it. It was for a congress. From the beginning there weren problems. No one spook English, French or German. Only Slovacs. The car could not stay on the place which was marked as Parking for the hotel. The room was on the 4th etage without lift. It was dangerous room with several obstacles for the head. Penzion Atlas This rating is a reflection of how the property compares to the industry standard when it comes to price, facilities and services available. It's based on a self-evaluation by the property. Use this rating to help choose your stay! Penzion Bonifac is located in the center of Liptovský Mikuláš, 2.8 mi from Aquapark Tatralandia. With music-themed décor, it houses the Atlas Restaurant with international dishes and the Hellas, which serves Greek cuisine. The en-suite accommodations units come with an LCD TV, Hi-Fi and a work desk. The Bonifac is 9.9 mi away from Chopok Jasna, the biggest ski center in Slovakia. Guests can also visit the Demanovska Ice Cave, 5.7 mi away, or the open-air museum in Pribylina with a traditional Slovak village. The museum is 12 mi away. Free parking is available nearby and private surcharge parking is available within 500 feet. Guests benefit from a 10% discount at the Šulo Restaurant on site. This is our guests' favorite part of Liptovský Mikuláš, according to independent reviews. When would you like to stay at Penzion Atlas? This spacious studio has a seating area, a fully-equipped kitchenette and a bathroom with a shower. It also features a balcony overlooking the city. Please note that the room rate is based on 3 guests. Maximum occupancy is 4 guests (see Property Policies). Private parking is available at a location nearby (reservation is not possible) and costs EUR 8 per day. This suite includes 2 separate bedrooms and 1 bathroom with a corner bath. Each bedroom has a TV and free WiFi. Please note that the room rate is based on 4 guests. Maximum occupancy is 6 guests (see Property Policies). This room comes with a desk and a private bathroom with a shower and free toiletries. This suite has a balcony, CD player and electric kettle. Please note that the room rate is based on 4 guests. Maximum occupancy is 5 guests (see Property Policies). Please note that the room rate is based on 1 guest. Maximum occupancy is 2 guests (see Property Policies). House Rules Penzion Atlas takes special requests – add in the next step! Penzion Atlas accepts these cards and reserves the right to temporarily hold an amount prior to arrival. Please note that check-in after reception opening hours must be agreed by the property in advance. Please inform Penzion Atlas of your expected arrival time in advance. You can use the Special Requests box when booking, or contact the property directly using the contact details in your confirmation. Staff tried to be helpful when I asked how can I get to the ski resort, but couldn't speak english. Was lucky to find a guest who could explain the route. There's a smell of garage on the ground floor that isn't very welcoming. Office style florescent tube lighting in the room. No car parking available. Low ceiling in the room on last floor (it's dangerous!). No free parking. No breakfast. Pillows must be replaced. Noise from the street - we heard every car though we were at the top. Only small things, like: Too warm during the night. Walking noise from the room above. No parking at the hotel, only close by. Parking near hotel is not available, or payable. Early check out (10:00). Breakfast is not included. There is no parking near hotel.